With expertise in veterinary pathology, clinical pathology and large animal medicine, Marion E. Smart proudly devoted her knowledge and career to guiding her peers and the younger generations. She started as a lecturer for a diploma course in veterinary pathology at the University of Saskatchewan in 1968, and stayed until her retirement in 2014. Some of her other positions at the school include assistant professor and associate professor in veterinary clinical studies, associate professor and professor in the Department of Veterinary Internal Medicine, and professor in the Department of Small Animal Clinical Sciences. She currently holds the distinguished title of professor emeritus. 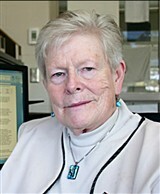 In addition to her tenure at the University of Saskatchewan, Dr. Smart has worked in various other capacities as well. She was the director of the pathology laboratory at the University of Guelph in 1978, and a pathology professor at Ontario Veterinary College at the University of Guelph from 1969 to 1973. She also contributed articles to professional journals and manuals, chapters to books, and posts to blogs. Some of the highlights of Dr. Smart’s career include developing a pet nutrition app, SNAP, for Apple and Android phones, being the first woman at Ontario Veterinary College to receive a Gold Medal at graduation for top academics and contributions to the university, and being chosen as one of the top 25 graduates at Ontario Veterinary College for her work in pathology. For her academic efforts, she earned a Doctor of Veterinary Medicine from the Ontario Veterinary College at the University of Guelph, a diploma in pathology from the University of Saskatchewan, and a PhD in animal and poultry science from the Department of Animal and Poultry Science at the University of Saskatchewan. Dr. Smart’s achievements have been lauded by her peers. She was featured as an Outstanding University of Guelph Alumnus at the 20th Anniversary Alumni Celebration in 1988, and received the Medical Research Council Fellowship from 1978 to 1982. She was also honored with the Major G. Athletic Award and the Bronze Award for Participation in Extracurricular Activities at University from the University of Guelph in 1968, as well as the Andrew Smith Gold Medal and the Upjohn Award for Bovine Medicine that same year. Additionally, she was granted the Third Proficiency Award in 1967 and 1966. Although Dr. Smart is now retired, she remains active in her professional community. She is a member of the American Holistic Veterinary Medical Association, the American Academy of Veterinary Nutrition, the Saskatchewan Veterinary Medical Association, and the Canadian Veterinary Medical Association. She is also a consultant and a teacher for an online nutrition course through Dogs Naturally Magazine Inc.